From the very start of DC Comics' "Rebirth" fans were given clear hints that Doctor Manhattan of Watchmen fame was behind it all... and finally, it's been explicitly confirmed. The reveal comes after months of speculation, as fans awaited more concrete evidence of the larger "Rebirth" story conceived of by Geoff Johns. And just as Johns announced the Doomsday Clock series starring Superman and Manhattan coming later this year, the glowing, blue, nuclear man reaches his fingers - literally, not figuratively - into the pages of DC Comics. It happens in The Flash #22, for those eager to collect the key issues in this re-writing of DC's New 52 Universe, as "The Button" draws to a close. The team-up between Batman and Flash centered on the eponymous smiley face button worn by Watchmen's Comedian, and in its final issue, left not a single mystery unsolved in the wake of the unforgettable death of Eobard Thawne. We're breaking down the key moments for posterity's sake, or for those unclear on the 'how' or 'why' of Manhattan's apparent execution of the Reverse-Flash. Barry Allen and Bruce Wayne may not have been able to link the murder to the blue-skinned being floating beyond the page, but readers definitely have. And when all is said and done, the final image of the issue is more than enough to keep fans on the edges of their seats until Doomsday Clock begins the next (final?) chapter. The issue picks up exactly where Batman #22 ended, as Barry and Bruce leap back into the Speed Force in search of the path home - only to run into Reverse-Flash chasing the otherworldly radiation of "The Button" to its source. In chronological terms, Eobard has already died. But by traveling through time, the readers are given a front row seat to his demise. 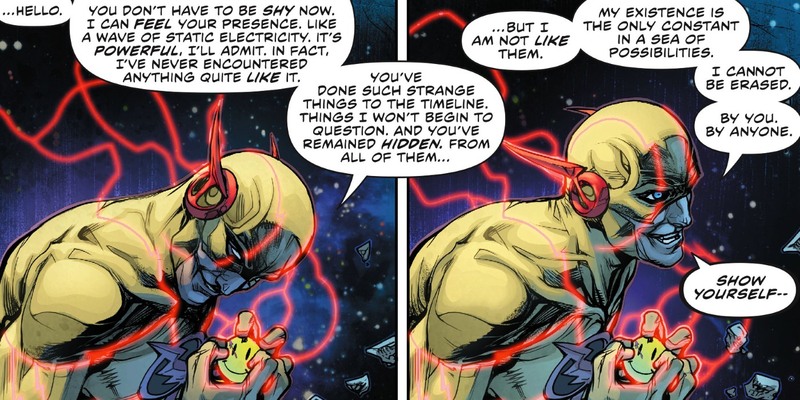 And, no surprise, it comes as a direct result of Thawne's ego, believing that he's somehow greater, grander, and more godlike than the rest of the DC Universe. Arriving at the end of the road, Thawne comes to a halt on a jigsaw-esque arrangement of floating rocks in what appears to be space (picture Thanos's Sanctuary from the MCU, and you're on the right track). Thawne chooses to approach his (unseen) target with an air of grandiosity, respecting this mysterious figure's changes to the timeline of the New 52 Universe - stealing a decade of love, friendship, and teamwork from its heroes - but stating in plain terms that he won't be manipulated so easily. The crucial mistake made by Thawne is assuming that the man behind the button is remaining hidden for a less-than-malevolent reason. He's not hiding, shy, or remaining invisible out of fear... he's hidden because he doesn't want to be seen - yet. That's bad news for Thawne, who immediately regrets his decision to speak so presumptuously to the figure before him, concealed in this strange, astral platform. Once the figure reveals themselves - visible only in swirls of blue-white light invading from outside the comic panels - Thawne recognizes he is truly out of his league. 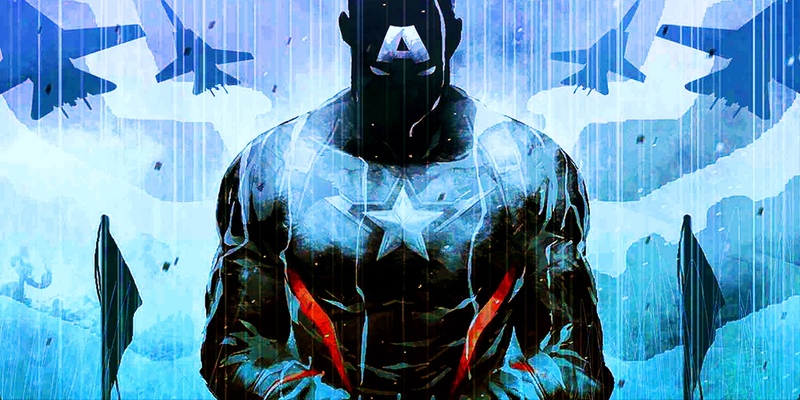 Muttering "My God" to himself (speaking literally, since he claims to have seen God just as he dies), reassuring the unseen figure that he simply "didn't know," and begging that he "doesn't want to die," he is torn apart on a molecular level, pulled to the source of the light off-panel in streams of blue-white energy. 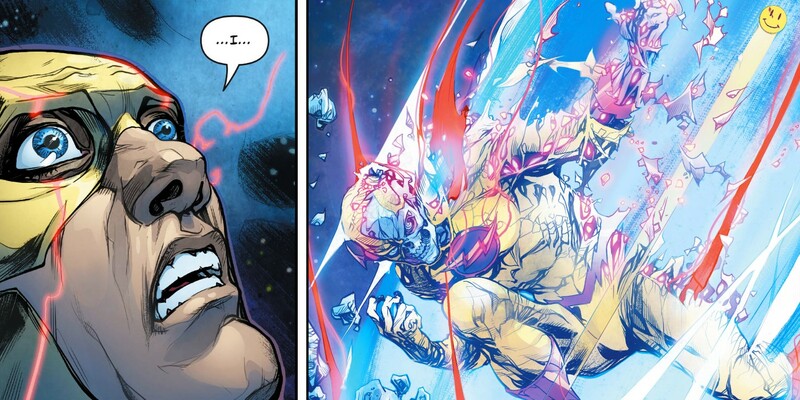 The button, too, is wrenched from his grasp as the entire left half of Thawne's body is reduced down to the bone. With that, he's gone, returned to the Batcave as seen in the first issue of the story. Now readers and our heroes can understand why Thawne's body was covered in Flash's Speed Force radiation, since he encountered the speedster right up to the moment of his death. But with the button itself now left behind wherever Thawne chased its energy signature to, and neither Barry nor Bruce able to follow him to this mystery villain, the mystery has hit a speedbump. The moment that comes as a shock to no one, but the birth of a thousand new questions, the story returns to that very button, resting on the ground where Thawne left it. Until it is illuminated by a blue light, and plucked up in the unmistakable fingers of Jon Osterman, otherwise known as 'Doctor Manhattan' of Alan Moore and Dave Gibbons's Watchmen. It's all readers get, as more of the original dialogue from Moore's graphic novel appears: in this case, Jon's claim that "everything is preordained" in his conversation on Mars with Laurie Juspeczyk. It's a conversation that gets to the heart of Doctor Manhattan's dilemma, trying to place value in life when the very nature of time and reality shifted from his perspective. Everything was as it would be, is as it is, and will be as is preordained. Jon believed that all the people in his life were merely "puppets" acting out existence the only way they could - he was just the puppet who could now "see the strings." So... what does that mean for the mystery of "Rebirth" as it approaches Doomsday Clock? Fans can only speculate or theorize for now, knowing that Watchmen concluded with Manhattan's stated desire to create life of his own, and this reminder that he believes his actions to be anything but his own. But has that changed in this New 52 Universe? Was he destined to kill Reverse-Flash for getting too close, or is he covering his tracks for some more dangerous purpose? Only time will tell... but it's nice to see DC is willing to confirm the figure at the very core of DC's "Rebirth" re-imagining, all the same. The Flash #22 is available now.